Absolutely breathtaking! Thank you for your inspiration here on Viewbug! Lovely addition to the Weston Challenge. Quiet linear beauty. Excellent detail, light play, colours, texture. You have my vote for black and white portraits photo challenge. Nice to see real portrait photography. ! Thank you so much for praising this photo! 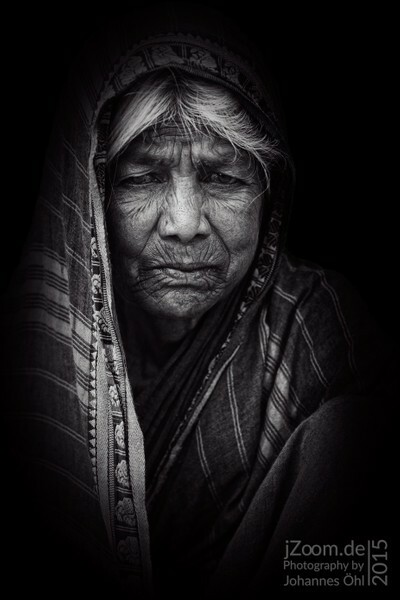 An old Indian woman shows dignity in here face. The photo is taken in the late morning. The weather was sunny with clouds. Not to bright. Perfect conditon for a portrait. I used my Nikon D800 with an almost 20yrs old Nikon Micro 105mm 2.8, which is still my favorite lens. No tripod or flash. This woman was obviously very poor but full of dignity. She was only sitting there and not asking the people for some money (never the less she got some money from me). Yes, a lot! The background of this photo was really ugly. So I removed it and replaced it with solid black. Then I used gradient filters to integrate background with the woman. Now it looks like she was sitting in a door or something like that. On my travels I have my Nikon D800 and some lenses: 50mm 1.8G, 80-400 + 1.4 Teleconverter, 28mm 2.8, 105mm 2.8 Macro, Metz flashlight and a Gitzo tripod with Arca head. Talk to the person before you take the shot can be inportant. This woman was really posing for the photo, so I got her personality. This is the way she wanted to see herself. I showed it on the camera monitor to her and she was really happy with the result. For the post processing: If you removing an ugly background and focusing to then only object, you have to take care that no borders of background and main object is visible.